Neckbone Graphics has expanded our product offerings to include various new items we're sure you'll enjoy. We have negotiated an agreement with Remo Corporation that allows us to distribute any item in their entire product line, including standard Remo drumheads and all world percussion instruments. 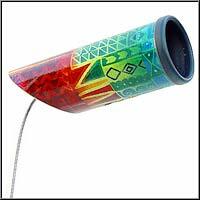 In many cases, Neckbone can develop custom graphics to be placed on the item. We've chosen to highlight several products from the Remo line, many with special Neckbone graphic treatments. 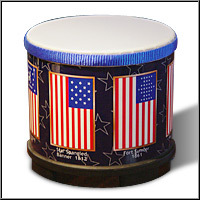 The fingerdrum, springdrum, and shaker may be well suited as gifts or to support corporate or organizational events. Contact us for general and quantity pricing. 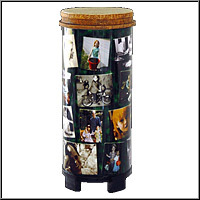 The tubano is a 22" tall drum with lots of space for customization on the shell. We've done several family photo collage versions that have become very special gifts. If you have any questions about these or any other REMO products not listed here, please contact us. We'll answer questions, formulate pricing, and post a quote for you if requested. This little tabletop drum measures 4.5" tall by 5" in diameter. and is usually played with the fingers. It has soft rubber feet and a genuine Remo pre-tuned head. It is a great candidate for your special graphics as a gift, or as a quantity item for special events. Our featured version was created in early 2002. The graphic features a display of 7 versions of the United States flag as it was flown at significant times in American History. These include the flags of 1776, (Independence), 1812, 1861, (Fort Sumter), 1941, (Pearl Harbor), and 2001, (9/11). It is a very special drum. Remo's Spring Drum has an amazing sound! This pro instrument is found in every theatre percussionist's effects bag! Simulate wind and thunder efffects and more. Remo offers a variety of models, some available with custom graphics. This model is our favorite. This instrument can have your custom graphics on either the head or the body. 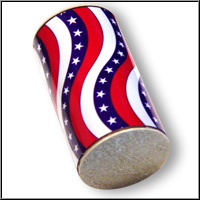 The Shaker is a great sounding instrument, available with Custom Graphics, perfect as a promotional item. Remo's 4" shaker is a professional quality instrument with a bright, rich sound. Neckbone's stock graphic is our own "America" graphic. We can also help you develop custom graphics to support your event or organization. Quantity pricing is available. Other World Percussion instruments are also available with custom designs. For more information, contact us!